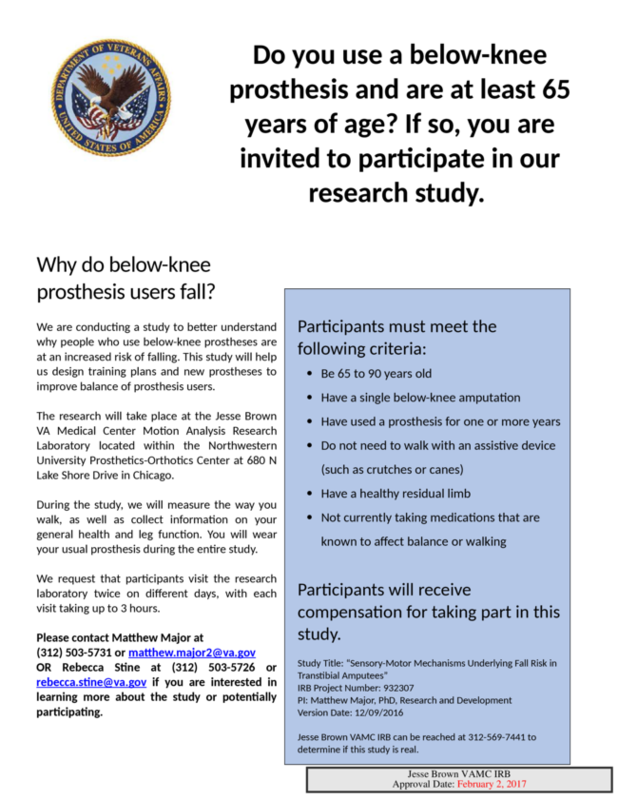 We are conducting a study to better understand why people who use below-knee prostheses are at an increased risk of falling. This study will help us design training plans and new prostheses to improve balance of prosthesis users. The research will take place at the Jesse Brown VA Medical Center Motion Analysis Research Laboratory located within the Northwestern University Prosthetics-Orthotics Center at 680 N Lake Shore Drive in Chicago. During the study, we will measure the way you walk, as well as collect information on your general health and leg function. You will wear your usual prosthesis during the entire study. We request that participants visit the research laboratory twice on different days, with each visit taking up to 3 hours. Please contact Matthew Major at (312) 503-5731 or OR Rebecca Stine at (312) 503-5726 if you are interested in learning more about the study or potentially participating. Participants will receive compensation for taking part in this study. Jesse Brown VAMC IRB can be reached at 312-569-7441 to determine if this study is real. People with hand impairment due to stroke invited to participate in research study. 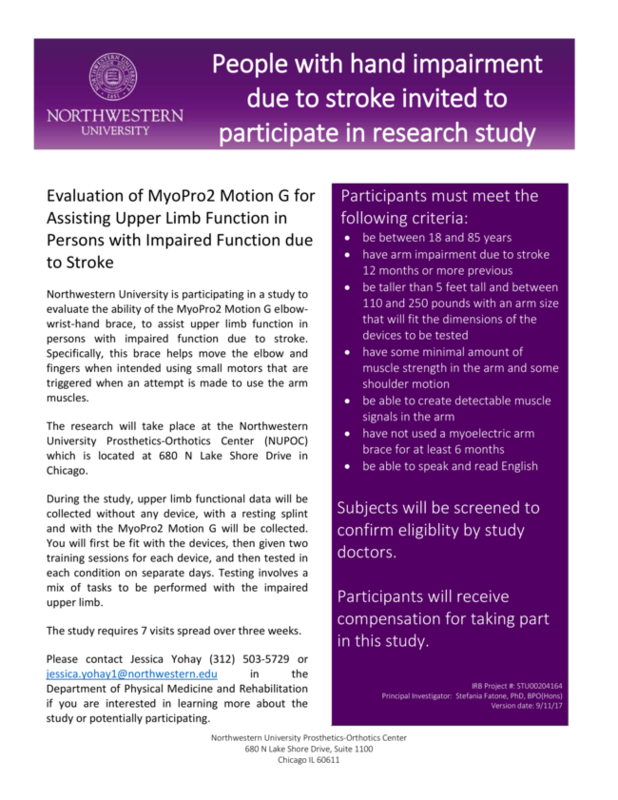 Northwestern University is participating in a study to evaluate the ability of the MyoPro2 Motion G elbow-wrist-hand brace, to assist upper limb function in persons with impaired function due to stroke. Specifically, this brace helps move the elbow and fingers when intended using small motors that are triggered when an attempt is made to use the arm muscles. Please contact Jessica Yohay (312) 503-5729 in the Department of Physical Medicine and Rehabilitation if you are interested in learning more about the study or potentially participating. Subjects will be screened to confirm eligiblity by study doctors. Chapter Bylaws and Guidelines Over the next few months the MWCAAOP Board will be considering changes to the Chapter Bylaws Guidelines, and is requesting member input during this process. The current documents are available below, and a draft of the recommended changes will be uploaded to this site when they are available. Please contact the Board President if you would like to propose any changes to the Bylaws and Guidelines.